Conferences highlight the value of shared time and place. 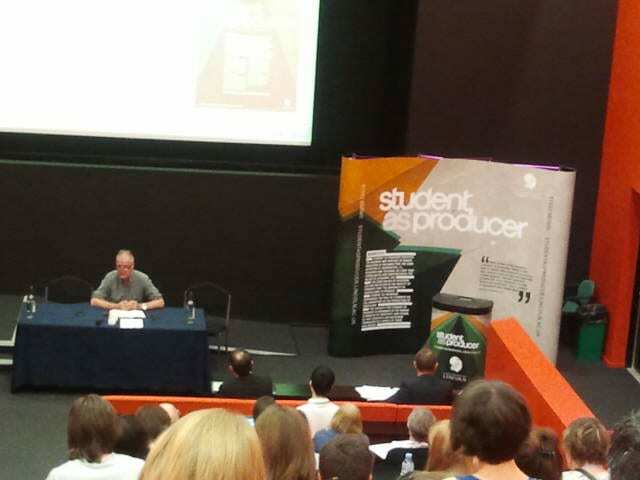 Mike Neary opened Day Two of the Student as Producer Conference. Disrupting traditional keynote presentation style, sitting behind a table with a hand written notebook, Mike talked about the layers of Student as Producer. It’s been three years. In that time, the eloquence of Student as Producer has become refined. There is strength in layers and Student as Producer has multiple levels of engagement. It’s also startlingly simple. Involve students in their education. Invite academics to rethink their teaching. Discover how the relationship between teaching and research can be made less dysfunctional. The thinking needs to be critical. Critical as political, as well as personal. Political thinking takes time. I’m not sure I’m political enough. Engaging with change isn’t easy. Not because changing practice is difficult – it’s the other, often invisible, requirements. Time. Motivation. Confidence. Change is resource heavy. We resist less through dissensus over new practice principles, but the weight of workloads, bureaucracy, administration. We rarely live in isolation and our others might not acknowledge the social and institutional crisis or ways to protect, defend and reinvent the idea of the university as a radical political project. I’m a pragmatist. I want to make a difference – who wouldn’t – but I’ve stopped trying to change the world. These days I focus on my little part of it, using education to raise awareness of digital divides and social necessity for digitally inclusive practice. I’m not a revolutionary Marxist, but the social impact of the internet drives me to challenge digital discrimination as a road to social justice. Digital scholarship is a strand of Student as Producer. The University is developing a Digital Education Strategy. Mike talked about the Reinvention Centre at Warwick; its absence of chairs and tables designed to destabilize expectations of an educational environment. There was no power point. Mike says the teacher is the point of power. Today, an internet connection is the point of power. Re-imagining scholarship for 21st century also requires attention to the digital aspects of education, in particular the parameters of access, exclusion and use. Maybe we’re not talking about this aspect of Student as Producer as much as we could. Next ArticleA PhD is for life, not just Christmas!